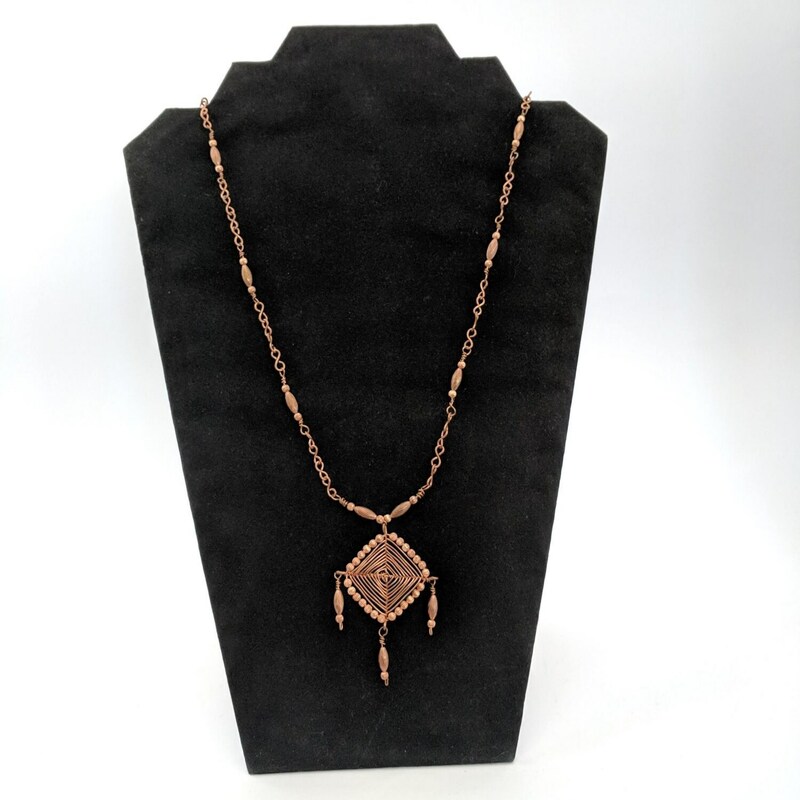 Copper wires woven in the traditional Eye of God pattern make up the central theme of this pendant. It is approx. 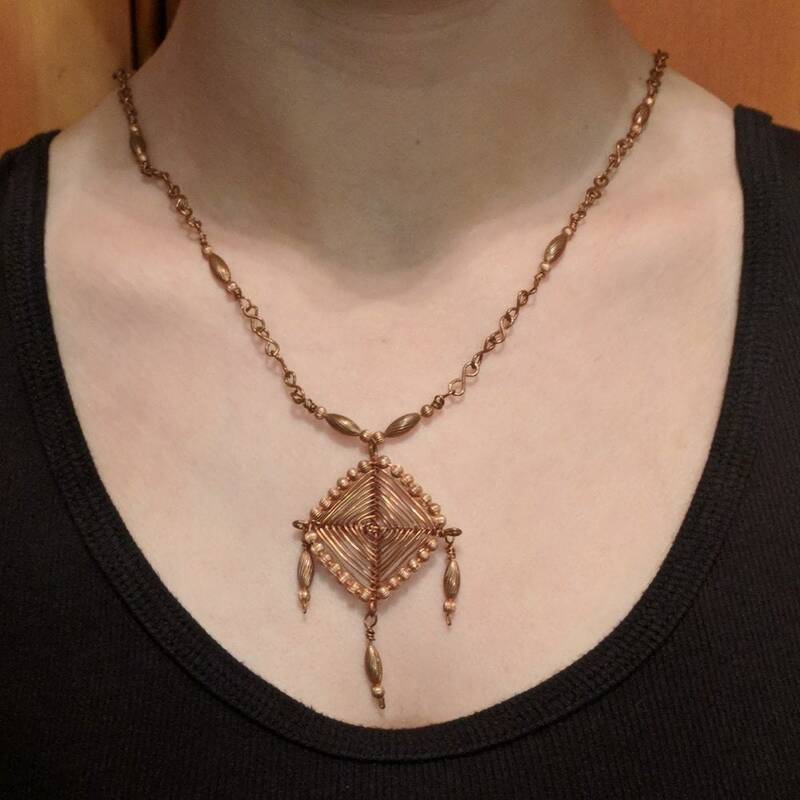 and attached to a handmade copper chain embellished with copper beads. 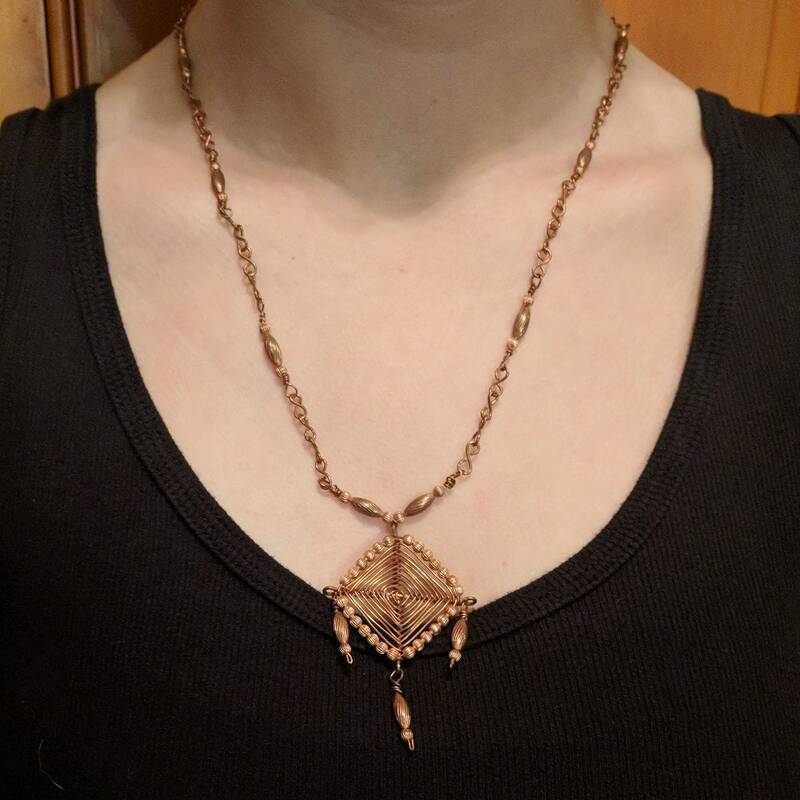 The 18" chain necklace is fastened with a handmade toggle closure. One of a Kind! HISTORY: The Ojo de Dios or God's eye is a ritual tool that was believed to protect those while they pray. It is a magical object and an ancient cultural symbol evoking the weaving motif and its spiritual associations for the Huichol and Tepehuan Indians of western Mexico. The Huichol believed that crafting an object was a way to get in touch with the spiritual world. For protection from the uncertainties of the future, the weaving reminded one that the Great Spirit was always watching over them. shamans (religious leaders who were believed to have powers of healing) and gods to travel easily between the spirit and earth worlds. Young Huichol children were guided on a mock pilgrimage carrying god's eyes and other oerings so that the gods might learn to recognize their faces. 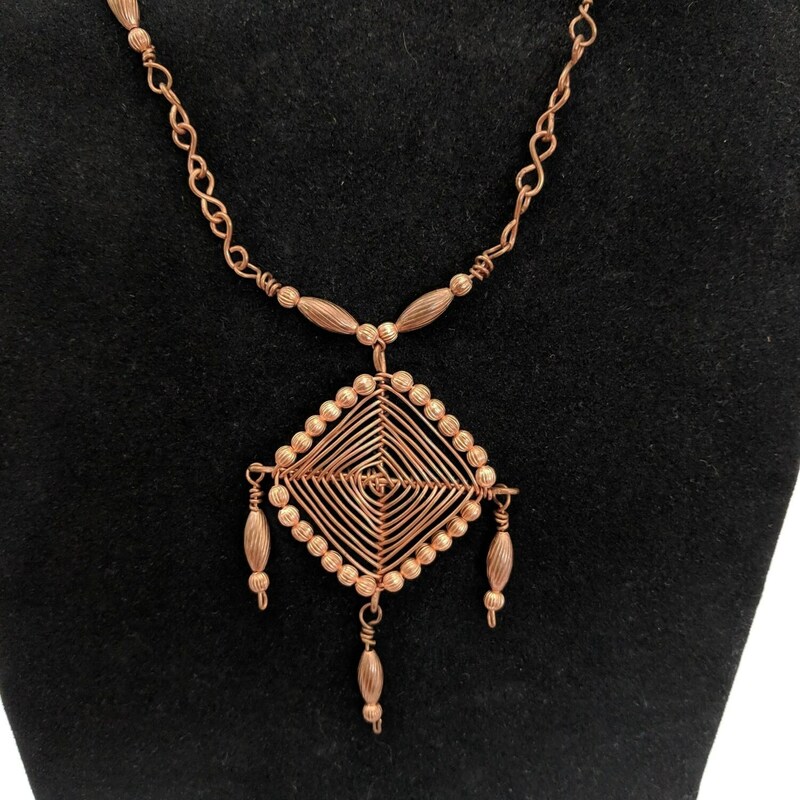 The Hupa wove similar charms out of straw or yucca and hung them over babies' cradles, and among the Pueblo groups, women wore small ones as hair ornaments. 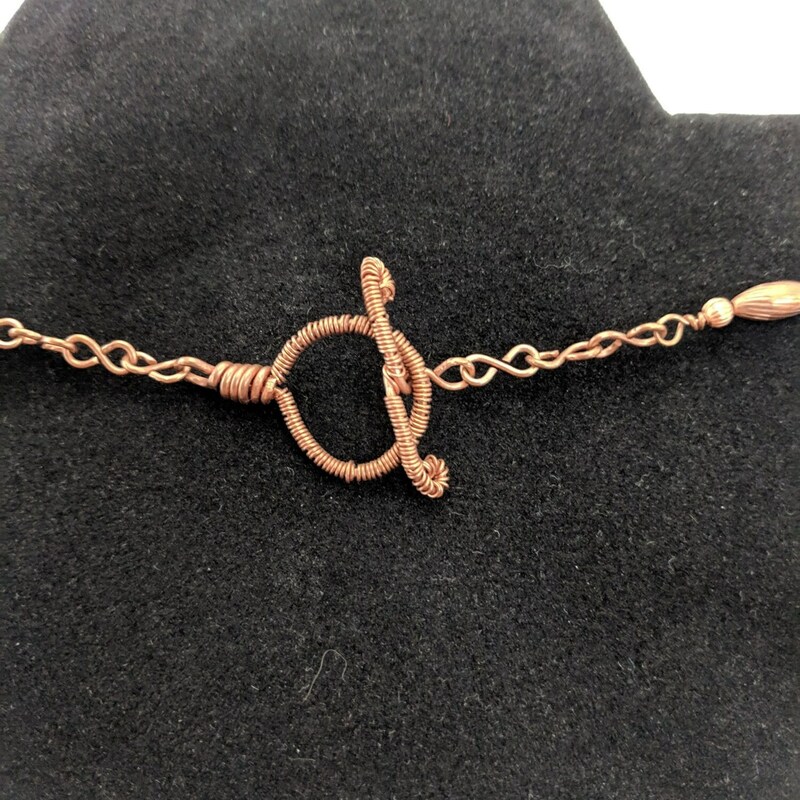 COPPER: Copper is conductive so many people believe it helps the energy flow through the body relieving ailments like arthritis, rheumatism and any painful condition. 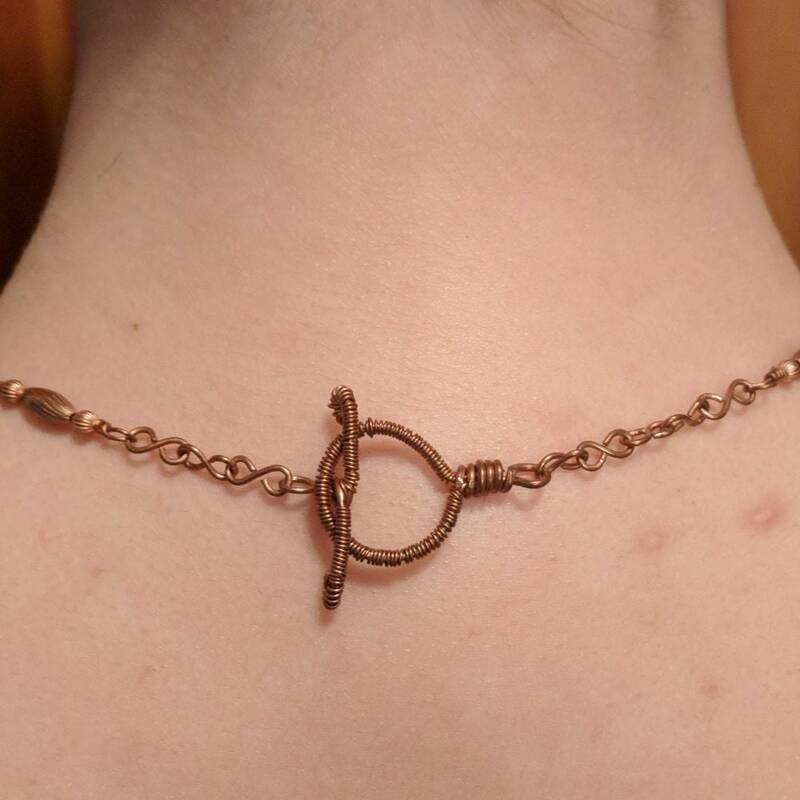 Can be worn for general healing and to prevent sickness. To be most effective wear in on the left side of the body if right-handed and the reverse for left-handers. In ancient Mesopotamia, it was attributed to the Queen of Heaven as well as the goddesses associated with the planet Venus: Ishtar, Astarte and Inanna (their Sumerian predecessor). In Roman times, this included Aphrodite, the goddess of love and beauty.